June Elizabeth (Farrar) Lemanski, 85, of Plainville, passed away on Friday, July 27, 2018, at Apple Rehab of Farmington Valley in Plainville. She is now reunited with her loving husband of 60 years, Walter Lemanski, who predeceased her in 2013. June was born November 7, 1932, in Bristol, Conn., daughter to the late Gerald and Vivian (Johnson) Farrar. 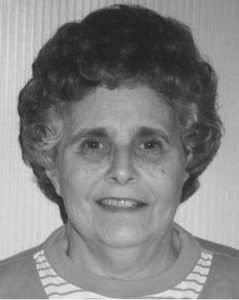 She resided in Plainville for most of her life and graduated from Plainville High School in 1950. June worked as a travel agent for AAA where she retired after 10 years. June leaves behind her grandson, Joseph Santacroce; her godchild, Catherine Martin and her family; and several cousins, nieces, and nephews. In addition to her husband, June was predeceased by her son, James W. Lemanski, and her two daughters, Susan Kopec and Patricia Santacroce. A service in celebration of June's life will begin on Thursday, August 2, 2018, at 10 a.m. at Bailey Funeral Home, 48 Broad St., Plainville. Rites of committal will be held in Saint Joseph Cemetery, Plainville. Friends and family are welcome to gather at the funeral home between 9 and 10 a.m. prior to the service beginning. In memory of June, donations can be made in her name to the American Lung Association, National Direct Response Headquarters, 1200 Hosford St., Suite 101, Hudson, WI 54016-9316. For more information or to leave online expressions of sympathy, please visit www.BAILEY-FUNERALHOME.com . Posted in New Britain Herald, on Tuesday, 31 July 2018 18:55. Updated: Tuesday, 31 July 2018 18:57.